Welcome to my personal dump. Hi, I'm Bob. I've finally created a central place to post all the random bits of crap I produce... and as luck would have it, this is that place. I've released the first public version of flameslater, a script for Autodesk Flame that takes .csv files and turns them into .ttg Text setup files for batch creation of slates. Never re-type long spot titles or complicated spot codes again. Check it out it on my GitHub. Illegal is a utility Matchbox shader for Autodesk Flame, Flame Assist, Flare and Smoke that highlights pixels that are potentially illegal when converted into YUV colorspace. Click here for a little more information. Updated 23-Aug-2017: You can now optionally switch off RGB->YUV conversion to analyze the original RGB channels for highlighting under/over values. Guidance is a Matchbox shader for Autodesk Flame, Flame Assist, Flare and Smoke, that draws adjustable horizontal and vertical guides that can be used as a quick and easy visual alignment reference, or for measuring. Grab Guidance from the Logik Matchbook site. 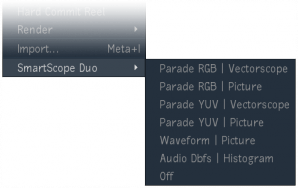 I've updated my Python hook script for Autodesk Flame which gives you control over a Blackmagic Design SmartScope Duo 4K from right inside Flame. This new version adds configurable Brightness and Contrast values, as well as a new "Off" mode that set brightness to 0 to effectively turn the backlights off. Download and instructions can be found on my SmartScope-Flame GitHub. 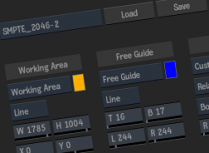 Download overlay guides for SMPTE 2046-2 Safe Action and Safe Title areas, in HD and UHD, for Autodesk Flame, Smoke, etc. Includes 4x3 raster cutoff reference and center-cut safe guides. Premultiply is a utility Matchbox shader for Autodesk Flame/Smoke/etc. that does pretty much what its name suggests: Premultiplies fills by their mattes – it can unpremultiply too. Now with user-selectable background color for both premultiply and unpremultiply. Ever needed to quickly crop a tagline off a logo or do a quick split-screen and felt irritation having to do it with a GMask when all you wanted was a perfectly straight line? Well, irritate no more and get Croptastic, a matchbox shader for Autodesk Flame, Flare, Smoke, etc. Looking to start playing with Asterisk but daunted by the number of configuration files and don't know where to start? Check out my Asterisk Primer and learn how to set up a system from scratch. Hurray, it's a new version of PinnedDown! 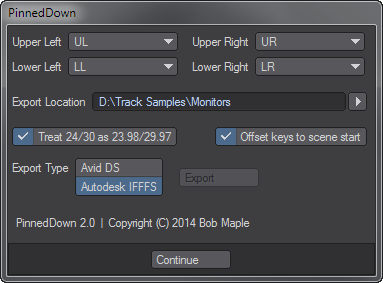 Since Avid finally completed the demise of Avid DS after a 15 year slow-murder since acquiring it, I've switched to Autodesk Flame and added support for it in this new version of PinnedDown. PinnedDown is a plugin for Lightwave 3D which takes up to 4 objects (usually NULLs) and exports their 2D screen position keyframes into Autodesk Flame, Flame Assist, etc. .ascii files, suitable for import into Action bilinear surfaces, or to Avid DS .fraw files for import into the Tracker effect. For more info and download links, hit up the PinnedDown page. Stop living in the 60's, Adobe. Powered by concrete5 / Theme by InnerOptics Updated: 2019-03-16 12:15:18 | © 2019 burner.com - All rights reserved.